Ganisa plana Walker, 1855, List Specimens. lepid. Insects Colln. Br. Mus., 5: 1191. Ganisa plana Walker; Holloway, 1982: 191. Diagnosis. This resembles a small, grey Eupterote but, unlike that genus, the double postmedial of the forewing is not replicated on the hindwing. It lacks the oblique forewing shading of Ganisa similis Moore. Taxonomic notes. Two ecological races occur in Borneo. A lowland race has genitalia matching specimens from lowland Sumatra, with a scobinate vesica. A montane race is larger, the valve costa angled, the vesica much less scobinate, and appears to be restricted to Borneo. More material is needed to establish the status of these races. Geographical range. Himalaya to S. China and Sundaland. Palawan. Habitat preference. See taxonomic notes. The lowland race was taken singly at Labi in Brunei and in a pitfall trap baited with fish carrion in lowland dipterocarp forest on G. Mulu. The montane race has been taken in upper montane (mossy) forest on G. Mulu and on Bukit Retak, Brunei, between 1600m and 1800m. Biology. 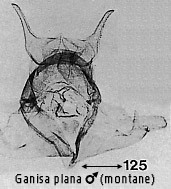 The larva of typical Indian plana was illustrated by Horsfield & Moore (1858-9). It is pale brown with darker secondary setae arranged in distinct tufts, paired on each segment dorsolaterally and ventrolaterally. The host-plant recorded was Jasminum (Oleaceae).